I had my very first photo exhibit yesterday. 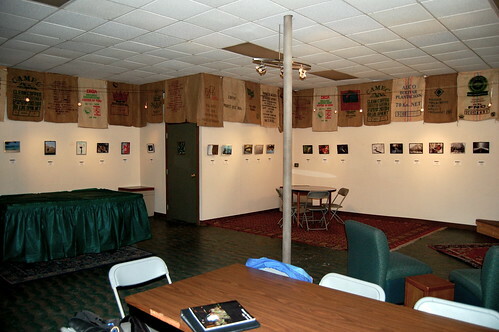 A local coffee shop - Escape Java Joint - has a gallery/performance space that is available for almost any sort of artwork. The process was thrilling for me. I had never taken such a step; to put my photographs so directly into the public eye, and for sale as well. While it's certainly true that both this blog and my Flickr source pages are "public", and many local people are aware of it, see my photos and comment on them, this felt significantly different. I had an enormous task of sorting through thousands of photos to identify 25-30 images to hang. In hindsight, I could have added another half-dozen as I had one blank wall in the back corner. 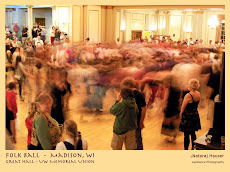 I solicited input from a bunch of friends and coworkers to help me winnow down the photos. I deliberately excluded people pictures unless it was some public event. The only one I settled on was the Bubble Guy from the Willy Street Fair. It seemed a shame to exclude some of the lovely dancer photos of Ayperi and Rivka or others, and all my candid portraits. Ultimately I decided that if I wanted to SELL anything, then I should withhold the people pictures and stick with the more general - plants and vistas, or inanimate objects. The images that made the cut can be found HERE. If you choose the "view as slideshow" option, you can pretend you are there! I made a deliberate decision to put all the photos in minimalist frames with no mats. I simply wanted the look to be photos on the wall. Obviously it's a bad idea to have the photo right up against the glass, and I will discourage anyone from buying one framed this way. Instead I'm suggesting they buy a print and frame it the way they like. 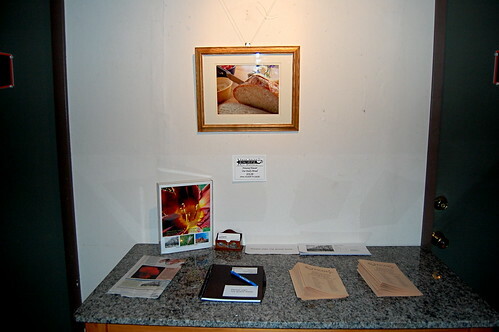 I made one exception with framing, and that image was used above the table with my guest book and order forms for prints. This image seemed to beg for a nicer wood frame and indeed it looked just about perfect. In all, I had over 50 people attend the opening reception. It surpassed my wildest expectations. For the entire three hour opening, there was never a moment when there were fewer than 8-10 people in the space. I am so grateful to my friends for such a showing of support, and even more so to the handful who opened their wallet and bought a print. Thank you!